TV Review: 'American Gods' Season 2 Increases Its Cast But Slows Its Pace The Starz series based on Neil Gaiman's novel about a clash between gods of the Old World and the New is back for season 2, having assembled a huge cast of characters — too huge, arguably. In the American Gods season 2 opener, Shadow (Ricky Whittle) approaches The Carousel, which will ... you know what, it's tough to explain. "He doesn't tell me anything." The tight-lipped "he" in question is Mr. Wednesday, aka Odin the All-Father, played with a knowing smirk and a kind of sidelong, Ian McShane-y brio ... by Ian McShane. And that "never tells me anything" bit is ... pretty much the central, overriding concept around which the first season of American Gods revolved. Over the course of those first eight episodes, Shadow found himself drawn into a conflict between the gods of the Old World and the New. The old gods, led by Odin, marshaled their forces, while the gods born on American soil like the mysterious Mr. World (Crispin Glover) and the callow Technical Boy (Bruce Langley) observed and plotted. And all the while, Shadow allowed himself to be led along on an extended, discursive road trip, only occasionally glimpsing the bleeding edges of true reality — namely, the fomenting cosmic battle — shuddering just below the surface. We, the viewers, were let in on the show's whole pantheon-vs.-pantheon schmear from the get-go, but Odin kept Shadow in the dark. Oh sure, McShane kept up a stream of coy hints, smirking clues and single-entendres, but never told Whittle's Shadow anything of substance. And Shadow just ... went along with it, muttering about how he didn't know what he believes, despite spending serious hang-time with a pugnacious leprechaun (Pablo Schreiber), the reanimated corpse of his dead wife Laura (Emily Browning), a handful of gods Old and New, recurring visions of a badass-looking Yggdrasil, the World Tree and a giant ghost-buffalo with flames flickering from its eye sockets. This is one reason that, despite season one's clever dialogue and many visually arresting set-pieces, the impression many viewers were left with was one of frustration. When the audience figures something out shortly before the main characters does, we feel smart. When we figure it out 10 minutes into the 8 hours it takes the guy to finally twig that hey, yeah, I guess buffaloes don't have eyes like Zippo lighters, we grow increasingly impatient. There is "skeptical," and there is "worrisomely slow on the uptake"; Shadow belongs in the latter camp. Or at least, belonged: Season one ended with the first out-and-out skirmish in the god-war, in which Wednesday revealed himself to Shadow as Odin. Viewers hoping this change to the show's status quo would effect a palpable change in Shadow's character will not be pleased to hear that while season two sees Shadow fully clued in, he's still going around in a fog of angry bewilderment — at least in the first two episodes made available to press. 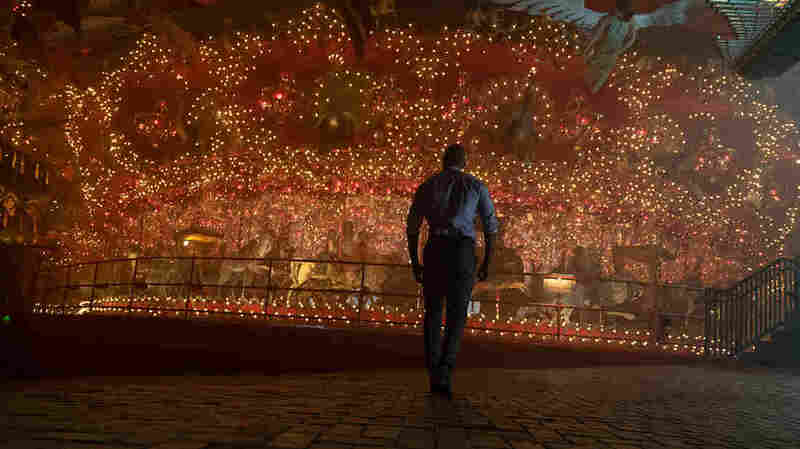 That Shadow is consistently, and by far, the least interesting thing in any given episode of American Gods is not the actor's fault; he's written to be the audience surrogate, the grounded, dull-as-dishwater hub around which much more colorful and fascinating characters, events and images revolve. Perhaps sensing this, season one showrunners Bryan Fuller and Michael Green took the Shadow-centric story of the Neil Gaiman novel and smartly shifted the focus to Shadow's compatriots (Schreiber and Browning have great onscreen chemistry), other gods (Orlando Jones swanning around as spider-trickster-dandy-god Mr. Nancy! Mousa Kraish and Omid Abtahi as a mismatched but literally hot gay couple! Kristin Chenoweth as ... Kristin Chenoweth, basically! Cloris Leachman as ... the Evening Star of Slavic mythology, I think! Look, it's a weird show! ), and the various villains of the piece (Glover, Langley and — most strikingly — Gillian Anderson as the shape-shifting, copyright-infringing god, Media!). Between production of season one and the (delayed) season two, there's been a series of showrunner shakeups. Fuller and Green left, as did their replacement, Jesse Alexander. Speaking to reporters in January, executive producer Gaiman strove to downplay this behind-the-scenes drama, and assured the gathered press that season two will look and feel like season one. McShane, at the same event, mentioned that season two will hew closer to the novel, specifically by getting "back to the line of the book which is Shadow and his story." He's not wrong about that: Just as season one saw deep dives into the backstories of Browning's Laura and Schreiber's Mad Sweeney, the second episode of season two is filled with flashbacks to Shadow's youth. It's a game attempt, and it's entirely possible that those flashbacks will enrich the character in episodes to come. But there is a dogged repetitiveness about them — they don't reveal much that's particularly revelatory, they simply reinforce what's already been established. So, Shadow still boring: Check. Everything else about the show still gorgeous, strange and clever: Check plus. Viewers will detect some measure of course-correction, last season to this one. The love goddess Bilquis (Yetide Badaki), criminally underused in season one, gets more to do, and say. Mama-ji (the great Sakina Jaffrey), a Hindu war goddess, makes for an intriguing addition to the cast. (Another addition, the mysterious Mr. Town, played by Dean Winters, comes off less sinister than intended, due largely to Winters' prominent side hustle in a series of inescapable insurance commercials.) Also new this season, though they do not appear in the first two episodes: Devery Jacobs' Sam Black Crow and Kahyun Kim's New Media (replacing the sorely missed Gillian Anderson). We get a welcome re-statement of principles to let viewers get up to speed (it has been two years, for us), and then — just as in season one — a sundering of the cast that, amid all of McShane's dire pronouncements of the coming war, can't help but seem like a series of side quests — diverting, in every sense of the word, but inessential. There's a crowded quality to season two's opening episodes, which teem with characters and locales, if not events. But at least when nothing happens on this show, it manages to do so gorgeously. Example: The wisdom of sending Mad Sweeney and Laura off on what's shaping up to be a series of fetch quests seems ill-advised, even if it does give the two charismatic actors shared scenes that highlight how well they click. Literally and figuratively, American Gods is building to something — an apocalyptic clash of ideas about who we are, what we believe and what defines us. The thing is: It's looking to be a long trip. And the show's eagerness to pull over to gawp at every roadside attraction along the way is only gonna make it seem even longer. But man, the scenery is pretty.